Is it problem with Meteor or VulcanJS or something else? I’m trying to kick start my first meteor project with another framework (VulcanJS) which based on meteor, but I have ran into some runtime which the browser (chrome) try to load the application. And I have raised it with Vulcan team, and they believe it is due to meteor 1.6.1, Node v10.0.0 and Npm 5.6.0 are incompatible with each other. 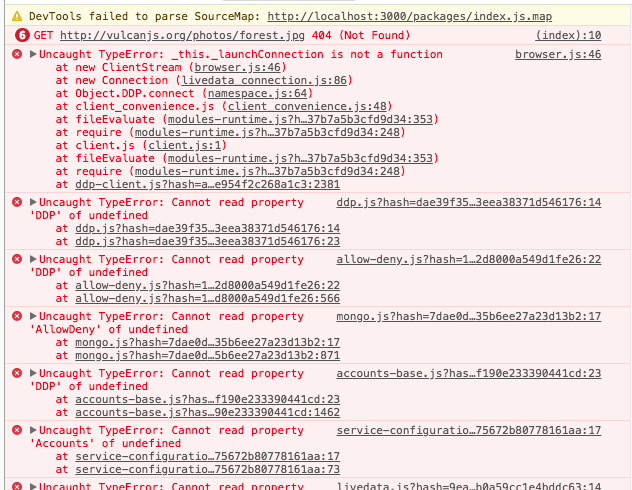 Anyone ran into the same problem, is it something to do with Meteor or VulcanJS? can you downgrade node to v8.9.4 to match meteor’s node version ? vulcan:ui-bootstrap  1.10.0  Vulcan Bootstrap UI components. Thanks and let me try to, will come back here. Vulcan-Starter example-instagram cannot be loaded and it seem to be caused by runtime error on Chrome as below. Seem it is related to some of the packages which need to be updated for the example project to works with latest version of node and meteor. I will try that out in my environment and give anyone a shout here. Pulling the latest master from starter project and followed all sort of suggestion, still no luck with example-instagram project but a blank page regardless whether it have error from console or not. Before giving up for other solution, is the following softward combination supposed will works? Or it need to be downgraded node to v8.9.4?